After busy bride-to-be Tasha Fusil and her mother Datin Jude Khadijah left a trail of breadcrumbs leading up to her anticipated nuptials, the day finally descended upon a fairytale garden-themed grand ballroom of the Mandarin Oriental KL. 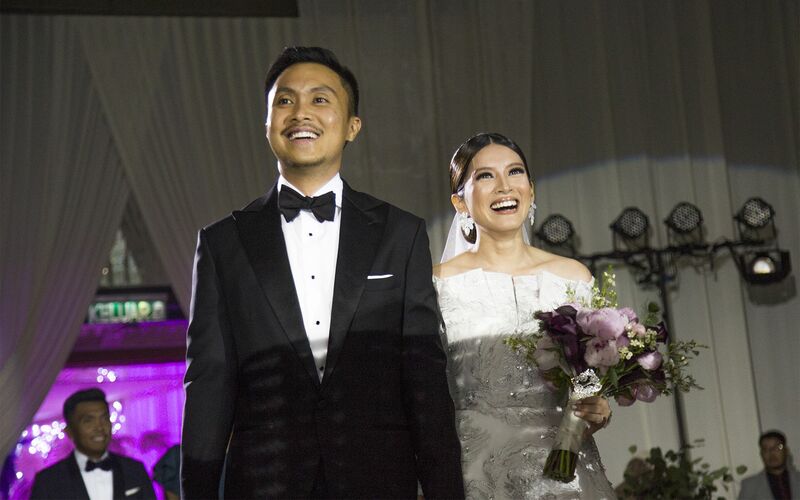 Tasha and her groom, Arfiz Ghaus, marched into their wedding dinner reception, beaming, as friends and family, including Ellie Norman, Dato' Sri Jeffrey Raymond, and Datin Paduka Marina Mahathir, applauded in welcome under a veil of floral décor and fresh bouquets. The newlyweds were recipients of heartfelt presentations all evening, as Datuk Wan Fusil Wan Mahmood delivered an emotional give-away speech for his youngest daughter, followed by a tear-jerking, sisterly one from Farah Fusil. An exquisite 4-course dinner was served as songstress Shareen Ramli sang a couple of romantic ballads, but the highlight of the evening saw the groom whipping out a microphone to serenade his teary-eyed bride with Michael Bublé’s ‘Home’.